The Mountain Man was a product of his environment and his society and his clothing would have reflected this. His clothing would have been some combination of the styles and materials of the white settlers and citizens, and those of the Indians amongst whom he lived. In writing this section I have relied heavily on the paintings, drawings and sketches of two artists. Alfred Jacob Miller was an artist, hired to accompany Sir William Drummond Stewart to the 1837 Rendezvous to record the event. Miller's paintings, which often have misty and surreal backgrounds, but show mountain men, their clothing and accoutrements in wonderful detail. Rudolph Friederich Kurz was a Swiss artist who had traveled to the west and kept a detailed journal and sketchbook. 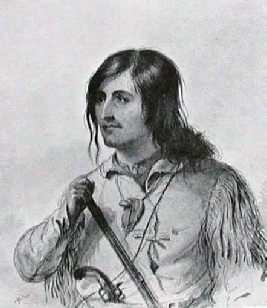 Kurz made a large number of sketches of whites associated with the fur trade and Indians in 1851 and 1852 mostly in the vicinity of Fort Union. Although the Rendezvous period had been over for more than ten years, Kurz does provide a good glimpse of mountain fashions associated with the trading posts at that time. A series of Thumbnails at the bottom of this section link to images that show clothing detail as record by Alfred Jacob Miller and Rudolph Friederich Kurz. A newcomer to the mountains might be clothed in shirt and trousers of cotton or linen but probably most often wool, in solid, natural colors, off-white, blue or red. Large prints and striped calico were also available. The newcomer might also have worn boots or brogans. Clothing made of fabric was popular amongst the experienced mountain men, and shows up in moderate quantities on the supply lists of goods taken to rendezvous. Fabrics, although comfortable, were not durable under the hard usage in the mountains, and replacement was not possible except at rendezvous or the widely scattered trading posts. The above image is “Antoine” by Alfred Jacob Miller. Clothing made of buckskin replaced fabric clothing as those wore out. Buckskin clothing, although heavily fringed, was generally patterned after white styles, rather than Indian styles. (1851 thoughts about Indian versus White Styles of Clothing) Buckskin, although cold in the winter and hot in the summer had the advantage in that it was extremely durable and wore like iron, provided protection from mosquitoes and other biting insects, as well as from thorns and brambles. Buckskin also had the advantage in that the raw materials were available in the wilderness, or finished clothing could easily be obtained by trading with Indians. Lewis and Clark, while on their journey of discovery, made at least one three-day stop, for the purpose of obtaining skins and tanning leather to replace their linen clothing which was deteriorating. 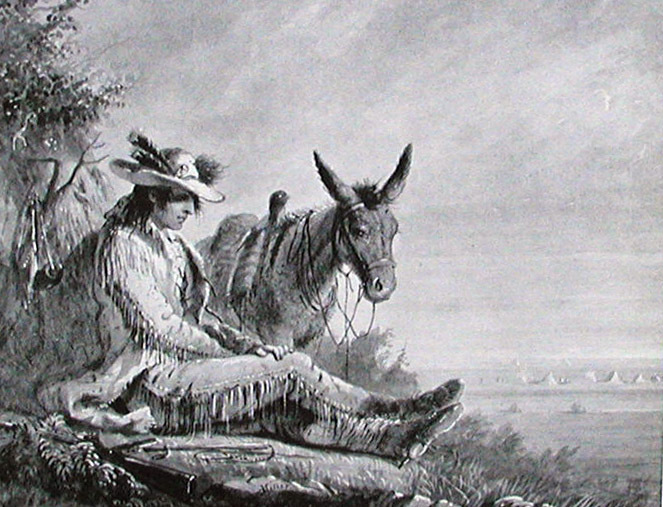 Buckskin Clothing was often completed with fringe along the seams. The purpose of fringe appears to be mainly decorative, although it may have softened the wearer’s profile while in the woods, making a less distinct target for enemies. I have also heard that fringe wicks water away during rainy weather, however, my experience has been “wet is wet”, and fringe provides no relief. Trousers of the 1820’s and 1830’s were high-waisted, and full in the hips and seat. There were three basic kinds of legs: the stove pipe cut, tapered cut to a small ankle, or cut to fit closely to the leg. Belts were not used to secure trousers at this time, but rather suspenders, ties or cinches. Alfred Jacob Miller shows trouser styles which include both the fall-front and fly type closure. 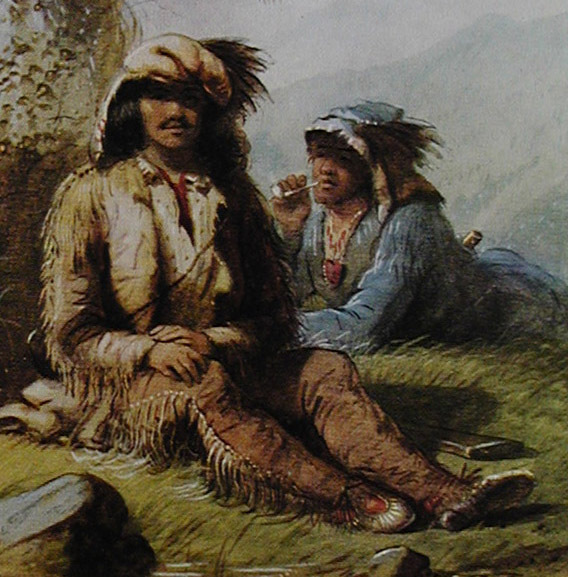 Mountain men depicted by Miller mostly wear buckskin trousers or pants, although a few are clearly wearing pants made of fabric, mostly blue in color. Leggings and Breechclout: Instead of trousers, a Mountain Man may have chosen to wear leggings and a breechclout. Leggings were held up using either ties or garters. Leggings and breechclout had the advantage in that they were simple to make, very comfortable and functional. Also, when setting traps, leggings were very easy to remove and put on. Alfred Jacob Miller depicted whites and half-breeds wearing white style clothing, none are shown in Indian style clothing. Kurz in his journal notes that Indians held in contempt any white man who wore Indian style clothing. 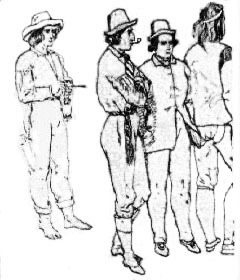 However, Kurz, in a sketch dated May 26, 1851, does show a figure labeled "Canadian Engagé" who appears to be wearing leggings. See Thumbnail E below. Belts were used to carry weapons such as sheath knives, tomahawks, and perhaps a pistol. Belts were generally not wider than 2 inches, and were left simple, without tacks, or rivets. Large woven sashes might be similarly used. Belts were not used during this period for suspending pants. Buckles when visible are generally worn to the side. Knife Sheaths: Knives were kept in simple sheaths at the back. Quilling or beading is not seen in any of Millers pictures. At most decoration is limited to a single row of tacks along the blade edge of the sheath. Most sheaths do not have a belt slot, but are simply thrust through the belt. Miller does show at least one sheath with a belt slot, and others that have a thong or loop to secure them to the belt. Shirts used by the mountain man would have been a simple pullover design with a large body and loose fitting sleeves. Solid colors, especially red, but including blue, green and yellow were favorites. Miller also shows light colored, widely-spaced prints. Shirts were a popular trade item at rendezvous and in any year hundreds might have been taken to the mountains (see trade goods). Hunting Coats: Many of the Mountain Men shown by Miller are wearing a leather, open-front, hunting coat. These coats are elaborately fringed along the shoulders, sleeves, fronts and bottoms. They range in length from mid-thigh to knee, and are generally shown with well fitted sleeves and collars. The coats do not have buttons, but close using ties. War Shirt. It is unlikely that Mountain Men would have worn the war shirt of the plains Indians unless they had been adopted into a tribe and had integrated themselves fully into the Indian way of living. Mountain men who might have been in a position to wear the War Shirt include Edward Rose and Jim Beckwourth. The War shirt is one of the most distinctive articles of clothing developed by the plains Indians. It was not just an item of clothing, but a mark of honor which could only be worn by one who had earned great respect. The decorations on the war shirt often had special meanings. Cleaning Leather Clothing: Generally white clays were used for cleaning buckskin and leather clothing. The clay was mixed with water until about four times the viscosity of milk, it was then applied to the surface of the leather item. The item was then thoroughly dried in the sun and afterwards rubbed until soft and pliable. Through this process every spot of grease or dirt was made to disappear and the skins assumed a milky whiteness. Red, yellow, blue or black clays could also be used, and would impart their own color to the leather. Capote: For cool and cold weather the Mountain Man would wear a capote. A capote is a long coat of simple design often with a hood. It was made from wool blankets, or wool blanket material which could be cut and assembled in the mountains. Capotes were also available for trade at rendezvous and at the posts. The capote dates back to at least the early 1700’s and was popular to at least the 1870’s. Although designed as a coat, the capote could also be used as an extra blanket for sleeping during cold weather. The capote alone is warm and comfortable, however, was large and loose enough that it could be worn over multiple layers of winter clothing. Blanket coats shown by Miller are commonly blue, blue-grey or green in color. The above drawing was made by Rudolph Kurz probably in February 1852 at Fort Union. The hunter is wearing a capote, mittens and a hat. Note that his gun is in a case. Moccasins: As boots or brogans wore out they were replaced by moccasins. Some men of the period, while outfitting in St. Louis are reported to have traded their boots for moccasins without waiting for them to wear out. I’m not sure how believable this is unless they had toughened the soles of their feet prior to trading out for moccasins. Shoes, both mens and womens styles were not an uncommon item on trade inventories. The womens shoes were obviously intended as trade items for the Indian wives of men stationed in the mountains. For more information on early 1800's shoes. There are nearly as many moccasin styles as there are Indian tribes. Moccasins drawn by Miller are all of a soft-soled, pucker-vamp style as shown in the painting the "Trappers". See Thumbnail B below. On Canadian Ground is a great website with information about moccasins and frontier footwear. Hats worn by the Mountain Men were wide, flat brimmed felt styles with a low crown. Most hats shown by Miller are twisted and bent from hard use. Felt hats are mostly light colored, off-white, tan or grey. Hat bands are simple cord, strap or ribbon. Quill or beadwork on hats or hat bands is not shown on any of Millers paintings. Hats are often decorated with feathers or tails and a clay pipe is often held in the hatband. Miller describes a kind of hunters hood made by the men themselves to replace felt hats lost or worn out. These hoods appear to be made from blanket material or leather. Many are constructed with "ears" and a flap reaching down to the shoulders, while others are of a shape defying description. Thumbnail D, below, from the "Trappers Bride" shows one of these hoods with "ears" Fur hats, especially those with face, legs and tail, which are so popular at modern rendezvous and Hollywood movies, are not shown by Miller who was only in the mountains during the spring through late summer 1837. However, Kurz does not show this style of fur hat either and he did spend several winters in the mountains at Fort Union. Hat fashions changed by the beginning of the 1850's. Kurz shows many hats with high crowns, also a fabric hat with a leather bill. Mittens: Kurz shows a hunter wearing mittens (see the drawing included with capote above) From the drawing it is not possible to tell if the mittens are constructed of blanket material, or leather and fur. Buffalo Robes are made of the tanned and softened whole-hide of the buffalo. Robes which include both the head and tail were exceptionally valuable to the Indians because they believed that the skin would inherit the spirit of the Buffalo in its completeness. Robes were prized both by the Indians and Mountain Men as a type of overcoat worn during the coldest times. Robes were simply draped over the shoulders, and held closed with the hands, or they might be belted in the middle. Robes are shown by Kurz as being worn fur side in. Robes could also be used as a carpet within lodges, or as bedroll when sleeping under the stars. Rudolph Kurz gives a description of how buffalo robes were prepared at Fort Union in 1852. Indians also used Buffalo Robes as a medium for recording belief systems or experiences of individuals or the society as a whole. The decoration of hides could be a very organized undertaking that was highly esteemed in the Indian society. Mandan women would wear rings and bracelets to show the number of robes they had decorated. Buffalo Robes replaced beaver in importance in the fur trade starting in the 1840’s. Buffalo robes were a trade item from the inception of the fur trade in the prairies and Rocky Mountains, however, due to the relatively much higher price of beaver, the size and bulk of robes, and the added effort of tanning robes, robes were generally less desirable than beaver. The mountain price paid for Buffalo Robes ranged from about $3-$5 per Robe. A combination of factors changed the demand for buffalo robes starting in the 1830's: prodigious numbers of buffalo skins were used for making belts to transfer power to machinery in the industrial age; a precipitous decline in the price paid for beaver; and a fad for Buffalo Robes in the Eastern United States as sleigh blankets, bed, wall and floor coverings. Attempts to popularize robes in Europe were generally unsuccessful due to the bulk and relatively high shipping charges. Because of their bulk, Buffalo Robes would not have become an important trade item had it been necessary to ship them east by pack trains. The buffalo robe trade was more or less limited to forts and posts along the Missouri River and its tributaries and to Bent’s Fort and its competitors along the Santa Fe Trail (at least until the coming of the railroods, but that's another story). Because of their bulkiness, buffalo robes (at ten robes to the pack) required a form of transportation capable of accepting very large volumes. The earliest transportation of robes back to St. Louis was by mackinaw boats and keelboats. Steamboats, starting in the early 1830's and then the railroads in the 1860's drastically reduced transportation costs and made the bulk and weight of buffalo robes a relatively minor consideration. As a result, buffalo, like the beaver before them, were driven to the brink of extinction. Bead and Quillwork: Alfred Jacob Miller only rarely shows bead or quillwork decorations on clothing. These decorations, when shown are simple narrow bands of color, or bands of alternating colors. It is not surprising that the mountain men would choose not to have elaborately beaded or quilled clothing. Such decorations would be analogous to wearing gang colors in a ghetto-a man would be asking to lose his scalp in the wrong neighborhood. Thumbnail A. Alfred Jacob Miller "Pierre" Pierre can be seen wearing pucker toe moccasins, fringed buckskin pants, a heavily fringed leather hunting coat, and a light colored flat-brimmed felt hat. In this picture the ties closing the hunting coat can be seen as well as a well made collar. The hat is decorated with feathers, and a tuft of fur. Although not clear in this image, there is a clay pipe stuck in the hat band. Thumbnail B. Alfred Jacob Miller "Trappers" The Mountain Man in the foreground is Moses "Black" Harris. Harris is wearing pucker toe moccasins, fringed buckskin pants, and a heavily fringed hunting coat. The ties for closing the hunting coat can be seen as well as a collar. Harris is wearing a white shirt with a wide-spaced floral? pattern over a red undershirt. Both Harris and the man behind him are wearing shapeless hunters hoods which appear to be decorated with birds wings. The man behind Harris is also wearing a small neck pouch in which he may keep his smoking supplies. 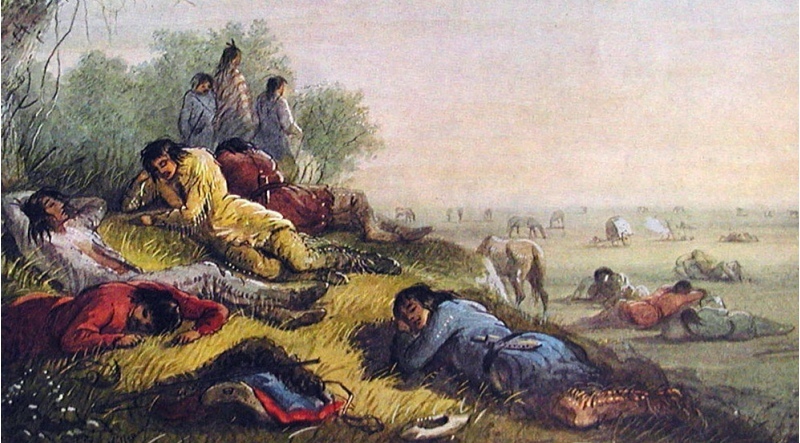 Thumbnail C. Alfred Jacob Miller "Noon-day Rest" All of the men appear to be wearing fringed buckskin pants. The various men are wearing fabric shirts colored red, white, blue or green. The man with the blue shirt has a knife secured under his belt. The sheath does not appear to have a slot or strap, and is decorated with a single row of tacks. 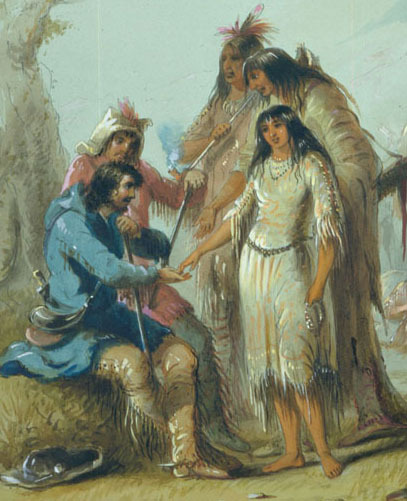 Thumbnail D. Alfred Jacob Miller "Trappers Bride" The groom is wearing a blue blanket coat with a hood. He has on fringed buckskin pants and moccasins. He is wearing simple post type spurs. At his side is a large black powder horn, probably buffalo, worn over his hunting pouch. The handle of his knife can be seen protruding from behind his back. At his feet is a flat-brimmed felt hat with a clay pipe in the hat band. The best man, behind him, is wearing a hunters hood with "ears"
Thumbnail E. Rudolph Freiderich Kurz. Series of sketches dated May-June 1851. From left to right the men are labeled by Kurz as Engagee, Trader, Guyotte, Engagee Canadian. The three men to the left are dressed very much in white styles, with fabric shirts, pants, jackets and felt hats. Note that the hats have much higher crowns than any shown by Miller. The trader appears to be wearing a sash. Guyotte, although dressed very properly, appears to be wearing pucker-vamp moccasins similar to those shown by Miller. The figure described as Canadian Engagee is most interesting. He is shown with a bandana around his head. He is wearing a fringed leather shirt, and it very much appears that he is wearing a breech-clout and leggings. The West of Alfred Jacob Miller (1837) from the Notes and Water Colors in The Walters Art Gallery: Published by the University of Oklahoma Press, 1968. Kurz, Rudolph Freiderich. The Journal of Rudolph Friederich Kurz: translated by Myrtis Jarrell; published by the University of Nebraska Press 1970. Rex Allen Norman, The 1837 Sketchbook of the Western Fur Trade. 1996, published by Scurlock Publishing Co., Inc. Texarkana, Texas.